Julie Stanford: Hello. This is Julie Stanford of Essential Business Radio. A few years ago, I was lucky enough to present a show called Business As Usual for Radio Reverb in Brighton. I still think that a number of these shows are very useful for businesses today. Business is about people. Creating the right relationships with customers, suppliers, and most importantly, employees. With these employees comes legislation. 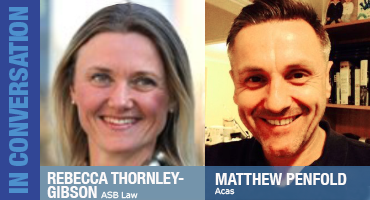 In this episode, I talk to Rebecca Thornley-Gibson of ASB Law and Matthew Penfold of Acas, about an employer’s responsibilities and your employees’ rights. Matthew Penfold: Normally I have three guests on this part of the show. Today, we’ve decided to have two experts because, the subject we’re covering is one that I know causes sleepless nights to many business owners. I’m really thrilled that both of you have agreed to come in and help us negotiate our way through the minefield that is employment. We’re going to have you here for two shows. The first show, what I’d love to cover, is the difference between the myth and the reality of employment legislation. As an employer, we all have responsibilities. We know that. We know that our employees have various rights. I think between those two areas, there’s a great big grey fog where we think maybe there are dragons in there actually. We’re thinking that something is so and it isn’t. You must both listen, and hear these stories, and just laugh sometimes. Rebecca and I were talking, before coming on the show, about the fact that as employers, we have a duty of care. We are running businesses. We should therefore be taking this very seriously. There is legislation which states that we must do things in a particular way. I think a lot of the confusion arises from ignorance. If you could help dispel these myths or put us right on the kind of things you know employers are thinking, which is not necessarily true. I think it would be great for today’s show. Let’s start then, and think about, as the general responsibilities of an employer, if you were advising an employer, what would you be making sure they were very aware of Rebecca? Rebecca Thornley-Gibson: I think if you start from the foundation of actually having a contract which sets out the expectations between the employer and the employee and the expectations both ways as well. With that contract as well, a job description so that the employee actually knows what they’re meant to be doing. One word of caution though, about a job description, is that it shouldn’t be so inflexible that if the employee’s asked to do something else they’ve got some sort of get-out from doing that because it’s, “Not in my job description.” I think that contractual position needs to be set out. It’s a legislative requirement anyway to have a statement of terms and conditions, statement of the particulars, given to the employee. Also, if things do start to go wrong, further down the line, it means the employer can at least point to something in the contract and say, “Well, you were meant to do this,” or, “You weren’t meant to do that.” Small employers tend not to, perhaps, have a staff handbook. That doesn’t stop them from having some kind of policies that might suit their business. Julie Stanford: If you haven’t written it down, you can’t then say to someone, “By the way, you haven’t done that.” If you haven’t drawn their attention to the fact that you wanted them to do it in the first place. Rebecca Thornley-Gibson: No. It is very difficult. A classic example probably on that, is something like use of the computer at work. If you don’t have a computer misuse policy, a computer use policy, or some sort of data protection policy it is quite difficult, then, to say to an employee, “I’m sorry but you shouldn’t have spent your time between 11 o’clock and half past 11 ‘surfing’ for your holiday.” If you do have a policy and there acceptable usage conditions in there, everybody knows what they’re allowed to do. Hopefully that’s to the benefit of the employee. They see that there’s a little bit of flexibility. The employer knows where they can then draw the line. Julie Stanford: Probably this is a stupid question maybe but, would you expect the employee sometimes to be included in that negotiation originally? Or would you just say, “These are the terms and conditions. This is your contract. This is your job description.” It seems to be, it might be quite a reasonable thing to do, to just ask their opinion of that. To make sure that you both agree and you’re both aware of the edges of it. Rebecca Thornley-Gibson: Best practice should be to consult about, as much as possible, that’s going to affect the employee in the work place. Employees won’t tend to be consulted when they start, about the contract that they’re given. They of course have the option of whether to sign it and start work in the first place. Once they’ve started work, if the employer then wishes to change the contract, they will need to consult over it and they will need to get the employee’s consent in the vast majority of cases, to change the terms and conditions. When it comes to policies that are not necessarily contractual, but are expectations of behaviours in the work place, then consultation is going to result in the employee probably adopting those policies with a slightly more harmonious attitude than if it’s just thrust upon them. Julie Stanford: Matt, does that ring bells with you? Matthew Penfold: Very much so. Yes. I’d echo what Rebecca’s saying there. I agree that the contract that’s put on the table when somebody’s taking up an employment, is probably, mostly, within the gift of the employer to set out. Yes, if you then go on and need to or want to, for whatever reason, which a lot of employees are doing at the moment, you want to amend that contract of employment, you need to, if you’re following best practice, change it by agreement with the employee. That’s if it’s possible to reach agreement with the employee, of course. If you can’t reach agreement with the employee, that’s not the end of the story, as Rebecca no doubt will tell us more about that. An employer can decide, if business reasons demand it, that it needs to unilaterally make changes to an employment contract. It just needs to do that in the right way. Contracts aren’t untouchable once they’re signed if business needs demand it, but you need to know the right ways to go about it. I’m sure that all employment lawyers and Acas advisors will be able to advise employers on those right methods. The policies and procedures angle is very important. I mean Acas tries not to spout the letter of the law all the time, we’re very much about talking of good practice. There’s not much getting away from the fact that some basic policies and procedures are the nuts and bolts of a well-run, effective company that can manage its people. I am a great believer in employees being involved in setting those policies and procedures. Very much as Rebecca says, if you help create the rules you’re more likely to live with them. There’s less likelihood of any kind of sabotage and employees understand the rationale of those rules having been set down as well. Julie Stanford: Rebecca, given what Matt was saying then, if you want to make a change to the contract subsequently, what would be the way you would advise an employer to go about doing that? If the employees say, “No. We’re not going to agree to that change.” As an employer, you would have to decide whether you’re going to take the nuclear option, effectively, which is to terminate the contracts they currently have and then offer to reengage them on the new terms and conditions which include the new restrictive covenant, for example. You’d have to make sure that you’d given the employees plenty of time to think about it. You’d have to make sure, as I’ve said before, you’ve explained why you needed to change this and why it hurts the business for this particular clause not to be there. Rebecca Thornley-Gibson: Absolutely. You’d have to show that there’s a real prejudice to the business by not having particular clauses in the contract. Julie Stanford: Something like a restrictive covenant would be a good one because it’s clear why that might be a problem? Particularly if you’ve had previous experience of employees doing just that. Matthew Penfold: I had a very real example before leaving to come to the show tonight. There’s a company that got in touch with me on the telephone this afternoon. They need to make a decision. In the very near future, we’re talking about the next seven to nine days, about how they’re going to save X thousands of pounds a year. They’re tossing a coin between considering whether or not to make a redundancy or to seek some input from their employees. By input, we’re really talking about a bit of code here for whether or not the employees would take a pay cut. There’s a lot of that going on. I urged consideration of that latter option. I think they will pursue that path. What you’re attempting to do there is reach an agreement with employees to change the rate of pay, a fundamental part of any employment contract. If the employees will agree to lower their pay, this can be a very valuable alternative option for an employer and can guarantee jobs for the near to medium term future. It might not always be the answer if you need to make a long-term, permanent change, but in times of recession, certainly there are more and more companies that are going down that road. There are a lot of employees quite happy to give this consideration. I said quite happy, I might be setting that a bit too high, but they can see the sense in keeping jobs at the expense of a slight reduction in pay. Julie Stanford: Rebecca, thinking what Matt just said, what would then be the reasonable steps that an employer should be taking? Actually what do they have to do? They’ve spoken to the employee. They’re trying to get the buy-in. Hopefully they’re going to get it. What happens then? What’s the next stage? Rebecca Thornley-Gibson: If they don’t get the buy-in, then they will have to make a decision as to whether they enforce the change, in which case there will potentially be a breach of contract situation which could leave the employer in a position whereby they bring an action in respect to the pay cut for an unlawful deduction from wages. The employee could potentially resign and claim what’s called constructive dismissal, “You breached my contract so I’m not going to continue working.” In the current climate, most employers know that’s probably not going to happen because of the difficulty of getting another job at the moment. There’s some bargaining power on the part of the employer at the moment when it comes to making efficiencies such as pay cuts. The employer might decide that, while we’re going to enforce the change by actually terminating the employee’s contract and offering them reemployment, re-engagement, under a new set of terms and conditions which will have the reduced pay. The employee then has the option as to whether to take that. We tend to call that the nuclear option because we would hope that before it gets to that stage there would have been enough dialog between the employer and the employee that they can have come to a pragmatic solution. Once you have to terminate somebody’s employment contract just so they will accept a change, you’ve lost an awful lot of trust and confidence between the parties in the relationship. Julie Stanford: It would be difficult to get back from that point wouldn’t it? To get that strong relationship back. Rebecca Thornley-Gibson: It’s very difficult. Then you have a demotivated set of employees working at a lower pay rate. Productivity is not going to be what it ought to be. It’s probably only a matter of time before those employees start looking around for another job to find a pay rate that’s more acceptable, or an employer that doesn’t enforce changes on them in the manner that that employer has done. Julie Stanford: Let’s think then. If there’s one area of businesses, I said earlier, that’s just full of myths, it’s got to be this whole area of employment legislation. Both of you are very experienced in this area. What are the kind of things that you hear employers, or for that matter, employees, saying that are not correct? That must be frustrating for you because you’re dealing in facts, in clarity. It must be frustrating when you hear all of us bandying around these stupid things. I said one to you Matt when I was on the phone inviting you to come on to the show. Julie Stanford: One of my employees had said to me, which I had believed was true, about making a telephone call to me. The employee had said to me that he’d been on the Internet and he said to me, “If I ring you at home, that’s okay, but if you ring me at home, that can be thought of as harassment.” I was really shocked. When I said that to Matt, he just said, “No. Actually, that’s not true.” There was I, labouring under the misperception that that was true. Matthew Penfold: Of course, if you phone your employee at home and start screaming obscenities down the phone, probably that is going to be harassment. I don’t think we were talking about that sort of approach. Julie Stanford: No. I wouldn’t. I’m far too nice. It’s good practice to set all of this down in a policy, to discuss it with staff, to consult over what you will do in the circumstance of a long-term absence. People will then have a clear expectation about what will happen if they’re off long-term sick. When the phone call comes from their supervisor or their line manager, it’s not a surprise. There will be trickier situations that employers will have to use their own discretion and judgement. If somebody’s off work due to anxiety or some sort of mental health disorder, then of course, an employer needs to play things a little more carefully. Julie Stanford: Or had a phone phobia. Matthew Penfold: Or if they had a phone phobia, yes. Julie Stanford: I’m being silly. Then you wouldn’t, would you? Julie Stanford: I’d pop around with a note if that were me. Matthew Penfold: Yeah. Pop around with a note. Send an email. Whatever. Have this in your policy and there’s no surprises. Julie Stanford: Yeah. Rebecca, any thoughts from that perspective? Rebecca Thornley-Gibson: I think one of the problems is that employers tend to think that they can’t win. For those employees … Some employees will like to be contacted at home. If they’re not, the first thing they’ll do when they get back to work is say, “I can’t believe nobody ever contacted me.” Some employees will categorically not want any work contact whatsoever. Employers are left in a position because they’re looking at it very much from, “I’m not sure what I should do because this particular employee might not like it.” Rather than having it in a policy and letting the employees know, as we’ve said, that if you’re off for maybe four days or more, you will receive a call from your line manager. If you’re off for two weeks or more, you will then receive a call from the director of your particular business unit. Then you’ll receive a home visit, so employees know that there is a structured pattern of care for them whilst they’re away. In terms of keeping in touch while they’re away, one of the things that I do advise employers to do, is on an individual basis, if it looks like somebody is going to be off on a relatively long-term sickness absence, I’m talking a week or more, is to actually try and agree with the employee what the level of contact is going to be. Each situation is going to be different and you don’t want a situation where an employee comes back to work and they do feel harassed. You haven’t harassed them. There’s no intention to harass, but you’ve got to bear in mind that particular employee. If a very over-enthusiastic office manager decides to call them every day just to check how they’re latest ailment is, it’s probably not going to go down very well. Every three or four days to perhaps call in, check every week, absolutely fine. I do think that there should be an agreement and particularly where we’ve got so many methods of communication now. It might be that, rather than a phone call, it’s an email. Most employees will be happy to email, let the employer know what’s happening. They may find that easier than a phone call. Julie Stanford: We keep going back to this, “is it reasonable”, don’t we? We’re going to touch on next week, the whole idea of when it goes beyond being reasonable, when you’re either taken to a tribunal there’s great discord. It does seem to me that if you lay down what’s reasonably expected so that you can draw your employee’s attention to that information, then you’re starting out in a sensible way. Matthew Penfold: Yeah. Yeah. People will agree what is and what isn’t reasonable, unless of course they’re unreasonable. Julie Stanford: We’ll talk about those next week. Julie Stanford: That’s another word. We’ve got reasonable and consistent. The way that the employer behaves has to be consistent across all employees. Rebecca Thornley-Gibson: That’s one of the hardest things to actually achieve in a business. Julie Stanford: Yes. I’m thinking from the employer’s aspect of having had some people who have been brilliant workers and they’ll go the extra mile when I need them to. I’ve had others who are clock watching. It’s human nature to treat those two individuals differently. Yet, what I’m hearing is, you mustn’t. You must be consistent. You must be reasonable in the way that you deal with these different people. Matthew Penfold: Yeah. That way employees will understand what to expect in certain circumstances. It wouldn’t come down to my personal relationship or how the boss feels about me. Julie Stanford: Yes. They see it as reasonable. Matthew Penfold: They see it as reasonable. In Rebecca’s example, Fred may well have that thought all these phone calls were actually bullying and harassment to get him back to work. There was a danger there. It’s all about minimizing the risk and trying to create a fair workplace. A felt fair workplace where everybody sees they’re being treated in the same manner. “If we’re off sick, we will all get a five-minute chat with the line manager on the day we come back”. Not just those people that traditionally may be viewed as ‘swinging the lead’. Julie Stanford: I think this is the area though … I can understand why so many business owners get unnerved by this because it is, even though we’re trying to say that it’s clear if you’re reasonable and you’re this. The very words consistent and reasonable are woolly in themselves. Although they feel as if they’re specific words, they’re not applying to specific situations. As you just said, your idea of reasonable won’t be my idea and it won’t be your idea, Rebecca. I think this is where, possibly, a lot of the latent fear that employers have, or probably employees as well, all the time because of legislation. I think some of this comes from that, the idea that the words that we’re using are in themselves difficult to define. Julie Stanford: Yes. Without a safety net. Matthew Penfold: Without a safety net. My position would be there, that I don’t think anything can replace talking to your workforce. Deciding amongst yourselves what is and what isn’t reasonable. If the mood of the workforce is to go towards a decision which is something the employer simply can’t live with, well, then okay, you’ve got to cross that bridge. Maybe that’s when you go to an external source of advice. If it’s stuff you can live, what you and your employees agree is what’s healthy for your workplace because it’s you that’s got to live with it at the end of the day. Julie Stanford: Rebecca, from your perspective as that tripartite view you’ve got, what else do you think is crucial for a listener who’s a business and an employer as well that they should really be aware of? A really important thing to think about when it comes to their responsibilities as an employer. Rebecca Thornley-Gibson: I would say address issues as they arise. Don’t address issues three months down the line. Particularly where it comes to performance. I’ll give you an example, one of my pet hates is people who think they can’t do anything until probation periods are up. An employee started and they’ve got a three-month or six-month probationary period. It’s pretty obvious, within the first month, that this employee probably isn’t going to cut it in the business. Yet, many employers think they can’t actually do anything, they can’t address anything, until the probationary meeting three months down the line. That’s ridiculous. You address issues as they arise because there might be something that you can do to turn around that employee and to save the recruitment fee you’ve just paid and avoid having to hire somebody else or have a gap in your business for a couple of months whilst somebody comes in. The training costs you just incurred by bringing that employee in. So many employers leave it too late. Leaving and not addressing performance will actually bring about almost a mark of acceptability of that employee’s performance so they think what they’re doing is absolutely fine. While the employer’s mumbling in the background about them to a colleague. Nobody wins there. I think one of my very sort of clear messages is address issues as soon as they happen. Do not delay. Then address them with clear, straightforward, simple language. I’ve heard a number of situations where people have been dismissed and the employer has dealt with the dismissal on the basis that, actually, the employee didn’t know they were dismissed because the employer was so bad at communicating the message. That’s fairly extreme but it’s bringing somebody into a room and not wanting to actually use the word, “You’re dismissed.” Using words like, “Let go.” “Not working out.” Those sorts of things. If you’re going to address an issue, make sure that the employee knows that you’re addressing it and exactly what you’re trying to communicate. Where can business owners turn for help? Julie Stanford: The problem we’ve got though, in business, is that people set up businesses. They then find that they can’t do all the work themselves so they need employees. Nobody taught them all those great skills that you need, the negotiation skills, the being clear, the understanding of the process. Nobody taught us that. We have to resort to, we don’t have to resort to it, but we do resort to woolly language because we’re embarrassed and we don’t really know the edges. We don’t know the legal position. I often, while doing this show, think about the poor, harassed business owner because I would, wouldn’t I? Having done it for so many years. There must be so many business owners who want to get it right, but they don’t know where to turn. We’re coming to the end of this part of the show, I’d really like it if you could just say where you would send a listener to to get rich information about the contract, about their responsibilities as an employer, about employees’ rights. Matthew Penfold: For that hard-pressed employer, that’s created their own business, because they wanted to create their own wealth and be their own boss, et cetera, suddenly finds themself landed with this plethora of employment law, think about either taking on your own legal advisor. Having somebody on a call-off contract. Or get yourself along to some Acas training courses. Julie Stanford: Excellent. Rebecca, as one of those specialists, I’m sure you have people ringing your up every day, either in a panic or thinking … And usually, probably, after the horse has bolted, or the employees bolted. What would you be saying would be a good way to really steer a path through this maze? Rebecca Thornley-Gibson: Yes. Sometimes we are seen as a distress purchase, solicitors, because people come to us after they have got it wrong. What we’re much keener to do is help employers get it right. We will point them to Acas websites. We will point them to very good government websites. The BERR [now BIS] websites are excellent. Julie Stanford: We’re going to cover next week, what happens when it all goes wrong and how you can deal with it. For now, thank you very much for coming in. This show was originally recorded for Business as Usual on Radio Reverb. I’m Julie Stanford. Thank you for listening to Essential Business Radio.